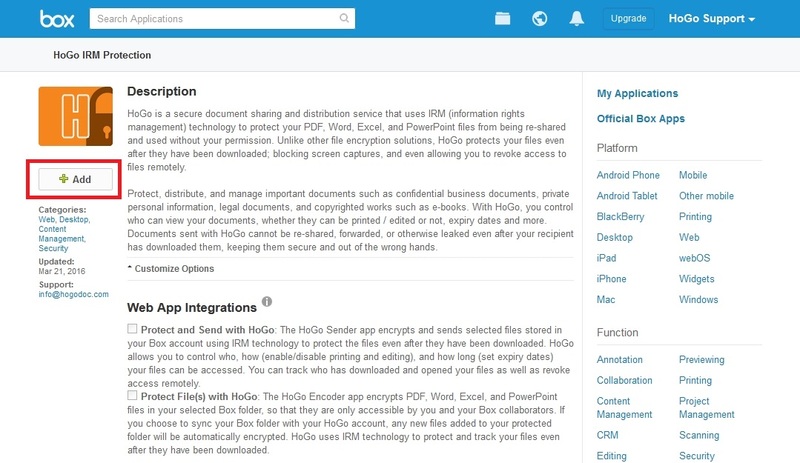 If you use Box for sharing files online with your collaborators, or to share important documents with external parties such as vendors or customers, HoGo now has an ideal solution for you. To start using HoGo with Box, log into your Box account and follow the following instructions. First, go to "Add Applications" from the More Actions menu. This will take you to the Box Application Marketplace. Here, type in "hogo" in the search window at the top. Finally, select "Add" to add HoGo to your Box account. Mouse over the file or folder you want to send and click the (...) icon. 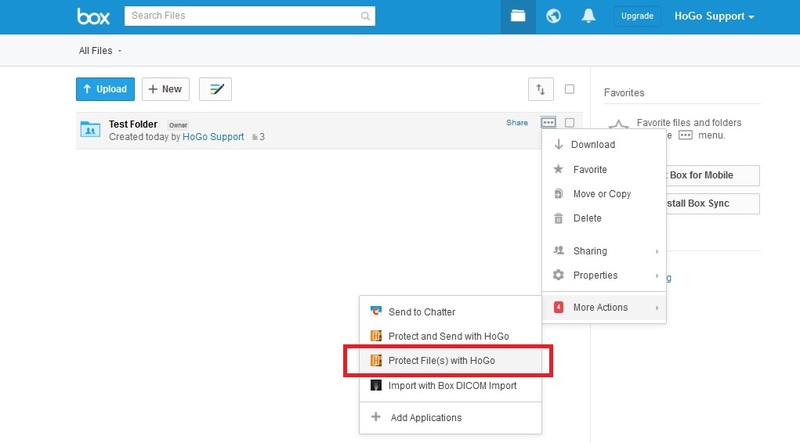 Select "More Actions", then "Protect and Send with HoGo". A pop-up will appear where you can specify recipients, document protection settings, and distribution settings. For more details on settings, see How to Use HoGo. Click on "Next" and you will see a screen where you can copy the link to download your protected documents, as well as send E-mail notifications with the link to your recipients. 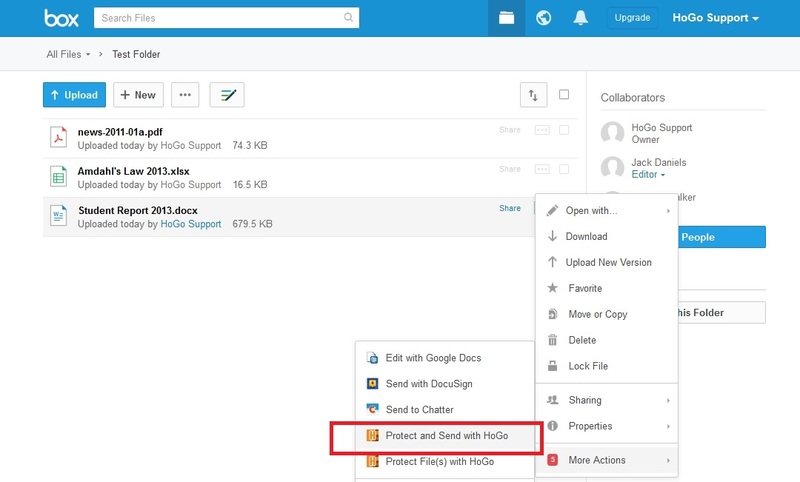 The "Protect with HoGo" integration can set up your selected Box folder to be automatically synced with your HoGo account so that all files that are uploaded, copied, or moved into the folder are automatically encoded. 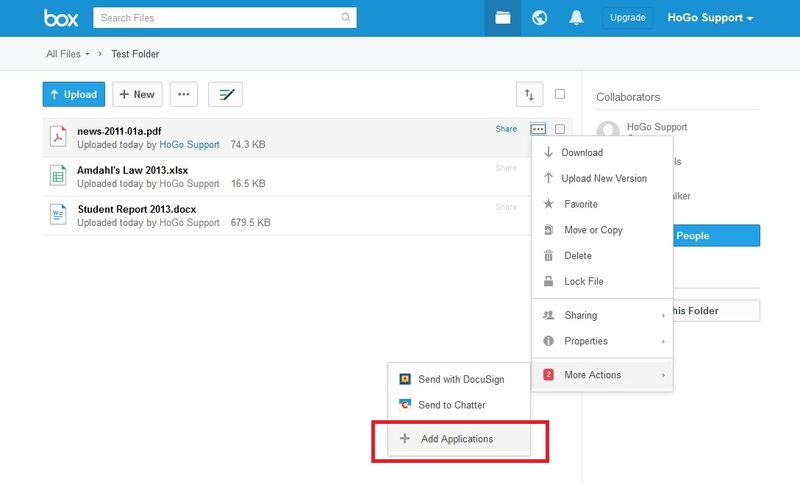 When you protect a folder with HoGo, all files and sub-folders within the selected folder will be encoded and only your collaborators will be able to access them. Among collaborators, only editors and above will have edit permissions for Microsoft Office files. 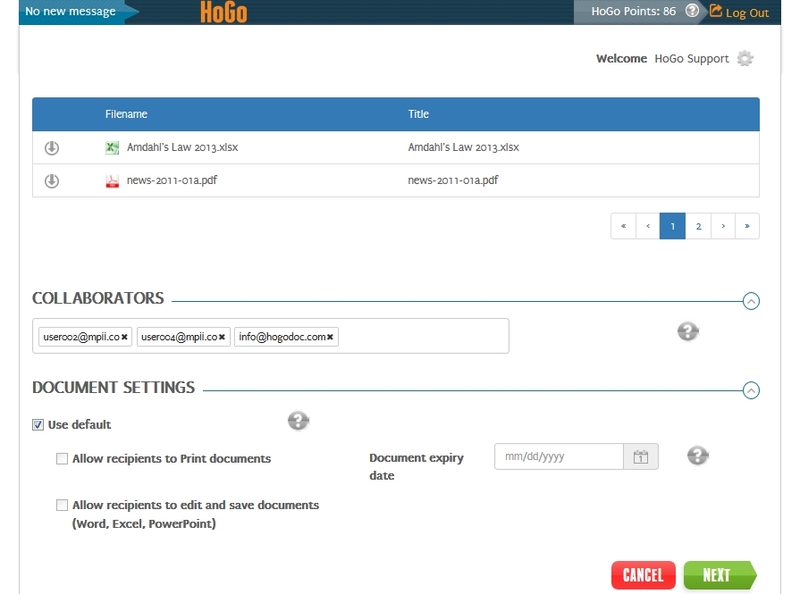 If sync with your HoGo account is enabled, any new files that are added to the folder will be automatically encoded. Changes to collaborators such as adding, deleting, and changing roles are also synced. You can manage synced folders in your HoGo account as well as turn sync on or off. If you remove a folder from HoGo, it will also be deleted from Box. To protect a Box folder with HoGo, click on the Protect with HoGo item below. Next you will see a pop-up to select settings. You can disable sync from this screen if you are only encoding files on a one-time basis. The default permissions are edit and save allowed for editors and above, printing disabled for all. Once you are done, click "Next". You will receive an E-mail once the encoding is complete and your protected folders will have Protected by HoGo in the description as below.